Have you ever wanted to save a snowman and make it last forever? In this unit the question is posed, “Do you want to keep your snowman?” Students explore the physical properties of materials and how matter can change. More specifically, students explore how the physical properties of water change. When removed from a cooler environment, their snowman will melt. The students learn about the three basic states of matter and design a shelter that will keep the snowman (solid) from melting (liquid). They explore and experiment with a variety of materials to differentiate between materials that are good insulators and materials that are good conductors. As each snowman melts, the water will be collected and measured to determine which snowman melts the slowest. Have you ever built a snowman and wanted to keep it from melting? 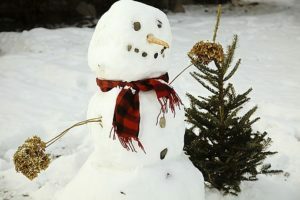 Your challenge is to create a shelter of a specific size to help insulate your snowman to keep it from melting too fast. You will be given a frozen water bottle to use as a snowman. You will also be given specific supplies to create an insulated shelter. The snowman will be monitored hourly to determine how slowly it melts. Browse the Stem Curriculum archive. Grade Level: 1, K. Content Area: Counting and Cardinality, Daily and Seasonal Changes, Earth and Space Sciences, Engineering, Geography, Key Ideas and Details, Literature, Measurement and Data, Physical Science, Properties of Everyday Objects and Materials, Science and Technology, Speaking and Listening, Text Types and Purposes, Writing. Industry: Advanced Manufacturing and Materials, Environmental Engineering. Bookmark the permalink.